Be fore warned, we will be mentioning the Newton below. No, we wont be saying that the iPad is a ‘new’ or a ‘big’ Newton. We are just saying that the Newton had some features that we have missed with the handhelds we have used at work since the late 90’s. A few things we used and are missing…. Smart text – write you have lunch with Client X next Tuesday and the meeting was created automatically. 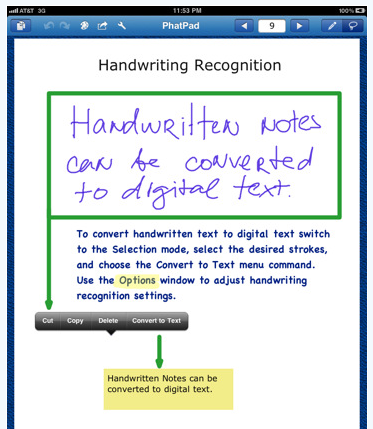 Handwriting recognition – write on the screen and it converted to ‘text’, worked better for some users than others. Correct shapes – draw a circle and it changed into a perfect circle (worked for other basic shapes too). The smart text has looked promising from a couple providers but yet to be fully delivered. 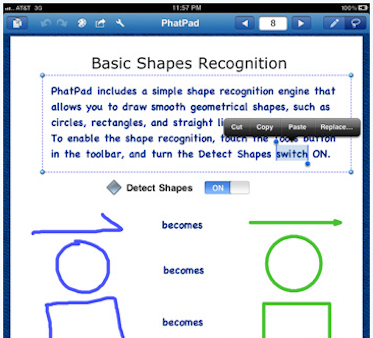 The handwriting recognition for the iPad has been getting provided by Phatware’s WritePad. We have been playing with a new iPad app from Phatware, “PhatPad for the iPad“. It has their highly successful handwriting engine (that learns as you write) but now includes shape correcting too. Draw a circle, square, a line and so on. Then let PhatPad clean up the lines. 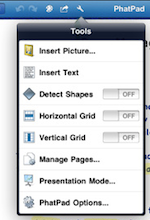 Just right for a presentation or document layout… without the need to jump to a graphic layout app and back to your document. 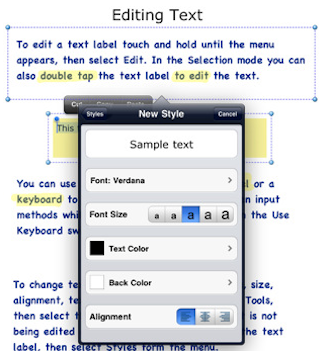 All of the text style adjustments and font styles enjoyed in the earlier WritePad app are brought forward to PhatPad. This means that this isn’t just a handwriting conversion software solution, it is actually usefull for full document layout and design. It’s all about sharing for us at the office… Send to a printer, send via email and export to a PDF to be share across Cloud solution means your not just producing documents for yourself. All of these features are not always wanted for a document being created. The more an app has to do, the slow it becomes as it goes through it’s list of features to help you out. If your just working with layout and design, turn off the handwriting recognition. Just doing notes without shapes, turn it off. Lastly, you can present directly out of PhatPad directly from the app. Using this mode takes the page up to full screen without the editing areas, then just flip through the pages you present your document.